My name is Shira Renee Thomas, and I am coming out of the closet. First, let me tell you who I am. I am an Opera Singer, and the Co-Founder and Co-Artistic Director of a small but well-respected opera company in Southern California. I am a Voice Teacher. I am a Wife and Mother. I am a Daughter and a Sister. I am a Colleague. I am a Friend. I am loving and caring. I am passionate. I am intelligent. I am giving. I am sensitive. I am creative. I am understanding and non-judgmental. My name is Shira Renee Thomas, and I have a chronic illness. My illness is similar to Multiple Sclerosis or Diabetes, in that it is a recurrent, potentially deadly disease that must be monitored and treated for a lifetime. My illness first attacked when I was 16 years old, and I have been fighting it ever since. As recently as two years ago, my illness almost took my life. It has almost taken my life many times over the past 20 years. It has landed me in the hospital three times, and in outpatient hospital programs twice. I will almost certainly be medicated for the rest of my life. My illness has gotten progressively worse over the last 5-7 years. I have at least 2-3 very serious, completely debilitating bouts of this illness per year. These flare-ups last anywhere from one week, to several months. I have had to give up pursuing an international singing career because of this illness, a decision I only recently realized was necessary for my health. I have never, in my entire life, been able to hold down a “regular” job, because of this crippling illness. I am not able to maintain close friendships because I don’t want to be a “downer”, so I isolate myself. I am terrified that I will not be a good mother to my baby, because I will not be able to manage my illness well enough. I’m fearful that my sweet, innocent daughter will inherit this horrific disease from me. Only a handful of people outside of my family know that I suffer from this disease. It is not something that is widely accepted or understood, and I have felt the need to remain quiet about my illness in order to avoid judgment from those who don’t, or won’t, understand. Today, I am coming out of the closet. My name is Shira Renee Thomas, and I suffer from Recurrent Major Depressive Disorder. Recurrent Major Depressive Disorder (or Recurrent Major Depression) is a serious illness that affects millions of people around the world. According to the World Health Organization, “Globally, more than 350 million people of all ages suffer from depression” (Oct. 2012). It has many common symptoms including, but not limited to, fatigue, irritability, feelings of worthlessness or guilt, insomnia, lack of concentration, memory loss, loss of interest in most or all normal activities, and persistent feelings of hopelessness, sadness, and emptiness (mayoclinic.org). Physical symptoms may include aches and pains, headaches, chest pain, and digestive issues (webmd.com). The most serious symptom of Depression is suicide. Writing down that I suffer from Recurrent Major Depressive Disorder (commonly referred to as “Depression”) is causing me a great deal of anxiety and shame, even now. But why? Why should I be ashamed of being the unwitting victim of a serious illness? Why is so much stigma attached to this disease? There are many answers to that last question. While these are disappointments that may make someone sad, they are not examples of Clinical Depression. Using the word “depressed” or “depression” in such flippant ways trivializes the illness for those who suffer with the disease, and it serves to invalidate Depression as a serious mental illness that needs to be treated by a professional medical team. It also contributes to a landscape of misunderstanding and trivialization in our society as a whole. When I am feeling sad or blue, I use the term “down” to describe how I’m feeling. When I tell my husband, “I’m feeling kind of down,” he knows that I’m not feeling good, but I am not depressed. I encourage you to find a word that accurately describes your mood when you are feeling less than good, and replace “depressed” with that new word. Some examples include the words “blue”, “down”, or “disappointed”. That’s an important statement. It illustrates the difference between those experiencing feelings of normal sadness, disappointment, and grief, and those who suffer from Clinical Depression. Seriously depressed people can’t “get over it” and “move on”. People who experience normal sadness and hardship are not to be trivialized or written off. They are just experiencing something different than what seriously depressed people experience and, therefore, those suffering from depression should not be expected to respond to and get through their illness in the same way. Another example of a common, inaccurate use of the word “depressed” is in a statement such as, “I was feeling depressed, so I went to Magic Mountain and now I’m feeling better.” People who are suffering from Clinical Depression do not have the ability to find enjoyment in activities that would normally bring them pleasure, such as going to a theme park. A seriously depressed person can be in their favorite location, doing their favorite activity, eating their favorite meal with their favorite people, and they will still feel depressed. They are unable to distract themselves or “snap out of it”. In the original statement about going to Magic Mountain, it would be more accurate to replace the word “depressed” with a word like “down”. People diagnosed with Major Depression do not have the ability to process thoughts and feelings normally. They are not able to see anything other than utter despair and hopelessness. 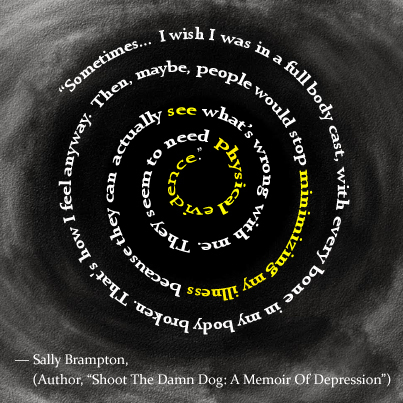 Images of blackness, deep holes, or long tunnels are often used to illustrate what Depression feels like. Many times, the sufferer feels like they have fallen into a deep hole, and they cannot even see the opening of that hole anymore. 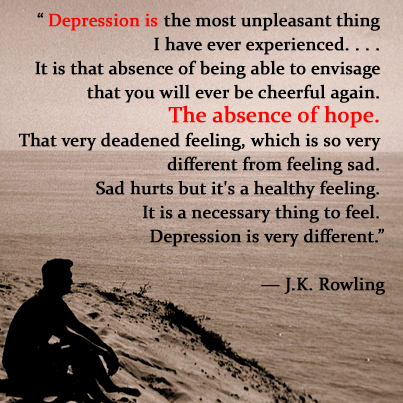 That is the hopelessness of Depression. Images of an isolated person in a crumpled fetal position are also regularly used to illustrate those who suffer with the illness. Many depressed people feel the need to withdraw from society, and can develop a type of social anxiety that causes them to isolate themselves. One reason for this is that they know (usually from experience) that most people do not, or will not, understand what they are going through and will say things that will only make them feel worse. Those suffering from Major Depressive Disorder do not always need an outside trigger to push them into an episode of Depression. The Depression that I almost did not survive two years ago was during a time that should have been full of happiness, excitement, and fulfilment. I was in a great place personally and professionally, and nothing had happened to me or anyone close to me that could’ve triggered my very fast decent into despair. Sometimes, there is no warning sign, even when you’re watching (and being watched) so closely for one. The good news for me is that I have a family that supports me and loves me unconditionally. My husband, parents, and siblings understand what I struggle with and are always ready to drop everything to catch me when I fall. I also have a therapist that I’ve seen continuously for 20 years, who is equally dedicated to my health and well-being. I have a wonderful psychiatrist who monitors my medications and provides medical support for me as well. I have a few friends who also do their best to understand my illness and, even if they may not understand completely, are always there to support me when I need them. I am one of the lucky ones. Many, many people either don’t have support systems in place, or are so ashamed to admit they have a mental illness, that they keep it locked up inside of themselves and suffer in silence, never seeking professional treatment (National Alliance on Mental Illness 2013). These are the people most likely to commit suicide. Seriously depressed people do not simply choose to end their lives because they are sad. They do not simply make a decision to “check out”. Depression is a disease that can be fatal; it just so happens that the fatal outcome presents itself in the form of suicide. When a person is in a serious depressive episode, they are not thinking clearly. Their thoughts are clouded by the disease. When I am not in a depressive episode, the thought of ending my own life is beyond my comprehension. I can’t imagine ever making that choice. However, when I’m seriously depressed, I have thoughts that I cannot control. I am truly not myself during those times. The disease takes over and makes it seem that there is no other option, and that my loved ones would be better off without me. Far from being a selfish choice, it seems that it is the selfless thing to do. It’s not rational. It’s not sensible. But that’s the point. Depression steals all logical thinking from you. Suicide is truly a symptom of the disease. It is not a simple decision that someone selfishly chooses. Suicide is an outcome that must be avoided by utilizing professional medical care, and through careful monitoring of those who suffer from Depression. In my entire 20 years of battling this disease, I have never “come out of the closet” about it to more than a handful of people. This is a terrifying step for me to take, but I feel that my finally being open about my continuing struggle might provide much needed support, understanding, and camaraderie to someone who needs it. Although I fear that more than a few people will judge me and no longer take me seriously in one capacity or another, this is something I need to do. I’ve been contemplating coming out of the closet for a few years and, with the sudden and tragic passing of an American icon last year (Robin Williams), I feel now is the time. If you read this and have any questions, please feel free to ask. I will do my best to answer them. If you read this and feel that we can no longer be friends or colleagues because of it, that is your choice and I will accept it. Thank you for reading this. I hope it will push you to learn more about Depression, to be a non-judgmental support to those you come into contact with, and to fight the stigma attached to this and all mental illnesses. I know I don’t know you as well as some, but this is beautifully written and such an important topic. I know too many that struggle with mental diseases. Thank you for the insight into yourself! I always thought you were smart, talented, and eloquent, but knowing the strength that also lies in your heart is inspiring. Thank you so much, Lauren. Your support means a lot to me. Thank you so much for posting this. A little over a year ago, I was diagnosed with Bipolar 2 with psychosis – something I had suspected for a long time – and it’s been quite a ride since. I often call my episodes “falling down the rabbit hole” due to the psychosis that tends to follow. I hope that managing it becomes easier for you and that LilyAnn will learn to understand it. Knowing who you and Dylan are, I’m sure she will. Thank you so much for sharing, Andrea. I’m so sorry to hear that you struggle with mental illness too. It’s definitely a tough road, but you are so strong, smart, and talented, I know you’ll find your way. And, like me, you have a very supportive family, which is so important. Beautifully written and sincere. I wish to give you a hug and know that YOU are never alone. If everyone is honest there are episodes in our lives that we can say would give us the same challenges as you have described. Perhaps not as frequent because we do not carry the same diagnosis. Thank you for being BRAVE. You are loved. Thanks for your brave and wonderful post. 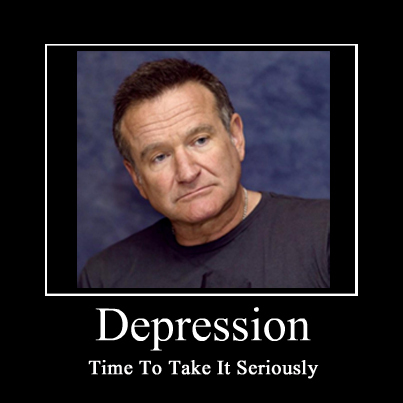 I was finally diagnosed with depression (though not as severe as yours probably) on the same day the disease killed Robin Williams. I have been pretty “out” about it, but I still sometimes fear to discuss it for the reasons you mention. As a fellow classical musician, I know how this can affect our chosen profession, and I applaud your tenacity and sincerity. Thanks for your poignant and timely post. Gary, thank you for your support. I’m sorry you struggle with depression as well, but applaud you for being “out” about it. I hope you are able to manage your illness well, and can enjoy a good quality of life. Thank you for your article. I don’t know you, but I can relate on so many levels to what you wrote. I too am an Opera Singer. I suffer from by polar disorder with major depression. I have had 3 suicide attempts and been hospitalized twice. I have recently had to come to terms with the narrowing of opportunities for me in my chosen path of work. I too have never been able to consistently hold down a job. I have only shared this information with a few people and some family. I am not sure what’s worse-having people in my professional life think I’m just a flaky, inconsistent person, or someone with a disease they may not understand. Either way, it’s good to know I am not the only one struggling with the same set of issues and circumstances. You are very brave. Thank you so much for sharing your story, Tisha. I’m so sorry you struggle with this too. I have also had to deal with the being “flaky” label, as I’ve had to withdraw from some gigs/rehearsals at various times over the years because I simply could not function. It’s a terrible feeling. I truly hope that you are able to find a treatment that works for you. Feel free to stay in touch. I’m going to continue writing about my experiences here. Thank you for “coming out” I share your illness and I have also shared your blog on mine! I am also an opera singer who because of the depression and now also the MS has had to find a non-traditional way to get gigs appreciate you speaking out and sharing. I am finishing my Master in Counseling and feel the pull to reach anyone who will listen but I have a passion for performing artists. The stigma is great but I am determined to eradicate it if at all possible. It should never be something you are ashamed of or have to stay in the closet about! Brava!! You did come out!! Thank you, Nancy. And “brava” to you for finding your own path, and for doing such important work! Shira, I don’t know you, but I see from your Facebook page that we have more than a few friends in common. I am so deeply moved by your “coming out” blog post. I am an American living in Germany, also an opera singer (as are so many who have posted replies here), who was hospitalized after surviving my first suicide attempt in March. I was quite disheartened by the way in which the doctors downplayed my suicide attempt, seeing it as some form of “acting out.” But like you, I was completely serious. I have been unable to find any doctor (including a psychiatrist I saw for talk therapy) to prescribe anti-depressants for me (Germans are extremely suspicious of any kind of medication through drugs). So I had to find my own answers and alternative therapies, which have seen me through some tough times. I created a secret page on Facebook where I can post to my closest friends about how I’m doing. I’ve begun a Buddhist practice, chanting twice a day. I have also resumed doing yoga. But to me, music is the greatest therapy of all, which sees me through the worst of days. Because there are still bad days. I salute you for your courage and I thank you for speaking truth about this horrible disease. I wish you courage, clarity, and equilibrium for the days ahead. Perhaps for us, like our alcoholic brothers and sisters, it is One Day at a Time. Thank you so much for reaching out, Daniel. I’m so sorry that you have suffered as well, and that you aren’t able to get the help you need in Germany. Major Depressive Disorder is such a highly misunderstood disease, and everyone seems to have a strong opinion about it. So many people don’t understand it, and therefore don’t consider it a “real” illness. I don’t really understand why so many people don’t take Depression and suicide attempts seriously. Even if someone’s suicide attempt was a call out for attention, that is still a serious thing. “Normal”, non-mentally ill people don’t feel the need to take such drastic measures in order to get help. This is why I have chosen to share my experiences here. I feel that it’s important for people to at least try to gain understanding of what true Major Depressive Disorder is like. Ok, I’m rambling now. The ECT has definitely caused my thinking to be jumbled. Anyway, thank you for reaching out. I wish you continued healing and support. Shira Renee you are such a brave woman! I commend you for speaking out about this horribly debilitating disease! I know there have been times you have been absent from my life due to suffering and fighting for yours. I want you to know that I admire you for what you are doing and the strength that you show every day will help your daughter be just as strong as her momma!! You know how amazing she is and such a blessing no matter what you are going through know she is a survivor! She has been put on this earth to help you have HOPE to show you the purest most unconditional LOVE! You are definitely blessed to have such a support system … I do feel for those that have to face their every day alone. Thank you for being in my life I love you! Thank you so much, April. This means so much to me. I hear you. And I know that what you say is absolutely true. I don’t myself have this diagnosis, but I am a support person of someone who does. Thank you for your brave, clear words. Unfortunately, there are Depression suffers who are not lucky to be surrounded with emotionally supportive family, including myself. I completely understand that I am unbelievably lucky to have a strong support system, and that many, if not most, people are not so fortunate. My heart aches for those who have no one to turn to in their times of despair. My hope is that by talking more openly about this deadly illness, more people will have the tools needed to be a support to those who are suffering. I can relate to some of your experiences, for me a major event happened which makes me lost interests in doing anything in life for almost 2 years and thinking of ending everything. As you said, all of my friends treat depression lightly and kept saying I will get over it but it hurts me much more when I hear that. Hi there Shira. I read Your statement, and I find it interesting and deep. You have a beautiful soul. I think, a strong one too, because admitting to Yourself that You have a problem, and what’s more – coming out with it – need a big dose of courage and will. There are people who basically don’t want to admit it, are afraid to do so, or simply are frightened of the feedback. You know, I am speaking about the still existing social stigma attached to it. World, people, society aren’t comfortable with problems and difficult topics. Because those need a deeper reflection, thought, introspection. Nowadays people prefer fast-paced life with shallow entertainment. Consumption became the main target. It is all very shallow, vain and fickle. I think we need to learn more about mental problems but not from theories and books, but straight from real people, people like You. That’s why it makes You so important for others. Remember that. Have faith. P.S. I am studying social work in mental health field. I would love to have a chance to talk with You. Thank you, Stan. I’d be happy to talk with you at some point. I hope you will always call me a “friend” and I’m always here for you to talk too. I’m so glad you have so many people in your “corner” and I KNOW HOW YOU ARE LOVED. We don’tg know each other very well well, however, again please consider me a sounding board any time. I have been through a lot in my “long life” and although it’s a disease difficult to understand I know it is there. You have my telephone number and email, please DO NOT HESITATE to contact me, someone who is not in your immediate family etc., is sometimes easier to talk to. Thank you so much, dear Sonia. I truly appreciate your love and support. I like your coming out piece very much. I am bipolar and truly understand what you are saying. You have done an excellent job of writing this. Congratulations on coming out. Thank you so much. It means a lot to me to know that other sufferers can relate. I appreciate your comment! My name is Norm. I don’t know if you remember me. I wrote to you a few months back not only to thank you for sharing your story but to also talk about my girlfriend who has been battling severe depression and anxiety over the last 25 years. She lost her father, a Vietnam veteran who was diagnosed with stage 4 pancreatic cancer last year. Tomorrow will be the one year anniversary of his passing. Last November she also lost her Nana. To say that this past year has been extremely difficult would be an understatement. She has lost her job do to this disease which is also caused her car to get repossessed, my car possibly getting repossessed, and us possibly getting evicted from our apartment for not having this month’s rent on time. I write to you tonight for two reasons. First, I wanted to thank you again for sharing your story. When I read it it really opened my eyes even more and helped me to understand a little bit better as to what you, my girlfriend, and probably hundreds of thousands of people have gone through or are still going through. I have shared your story with some friends and family members to help them understand exactly what depression is and how serious it is, and just how devastating it can truly be. I also wanted to share with you that over this past weekend my girlfriend has once again checked herself into the hospital and after meeting with her doctor we have decided to proceed with the ECT treatments. It has been a very long road for the both of us but finally a doctor has recognized after all these years that she does in fact have this disease and is finally helping her to fight back. Her first treatment session is tomorrow morning at 8:00am. Tomorrow is going to be along, tough day because as I said earlier it is the one-year anniversary of her father’s passing. I remain hopeful that this will truly help her be able to take her life back. I can’t stand seeing her in so much pain and not be able to take it away for her. We are both scared of what tomorrow will bring, and the days after. I believe however that we are even more scared of what would happen if we didn’t proceed with this aggressive treatment. I just wish that there was more that I could do for her. I feel so helpless. I guess the biggest question that I have if I may ask it is what did you find to be the most comforting when it came to other people wanting to help? Thank you so much for being able to share your story. He gives us great hope that they’re truly can be a better tomorrow. Hi Norm. I’m so sorry I am just seeing this. I’m very sorry to hear that your girlfriend is struggling so much. Is she still doing ECT? How is that going? It’s a very difficult process, but for me the positives far outweighed the negatives. To answer your question at the end of your message, for me it was very helpful to have my husband and family not push me or question me, and to just let me feel whatever I was feeling without trying to fix it. Coming out of a major depression is a long, very difficult process. It helped me so much to know that my family was right there whenever I needed them (sometimes just to physically be with me without talking), but they weren’t getting frustrated with me or trying to push me faster than I could go. When I was in my darkest depressions, I couldn’t even speak. So, my husband and I would communicate via text message, even when we were lying right next to each other. He just accepted where I was emotionally/mentally at any given time, and followed my lead. He never ever judged me. I truly hope your gf is finding some relief, and that you are too. Don’t forget to take care of your own mental health as well. Depression is very hard on the loved ones of those who suffer too. It’s amazing that you have ‘come out of the closet’ as you say. I myself struggle with manic depression and it was very interesting to read your views. I’m writing this while in a terrible place mentally right now which I can’t seem to come out of. Do you have any experience with therapy? And if so did it really help you? Hi Jamie! I’m so sorry you are struggling so much right now. I have been in therapy my entire adult life, and it has been an absolute life saver. You have to find the right therapist for you — someone you feel 100% comfortable talking to about anything, who will not judge you, who has a strong understanding of your illness, etc — and sometimes it takes a bit of trial and error to find that person. But I assure you, it is worth it! I hope you find the help you need, and that you are able to climb up out of that hole of depression very soon.